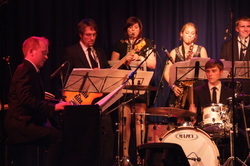 Below are some of the Jazz musicians Max has worked with over the years. Max Holloway is a Jazz saxophonist based in London, who started playing Jazz in 1995. He's played in several Jazz bands in London and wirites the Jazz blog here. 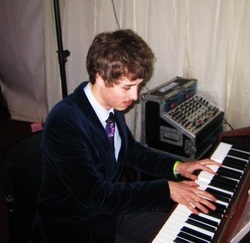 Michael is a Jazz pianist I first met at the UCL Jazz jam, while he was studying medicine. He is a fantastic solo jazz pianist and has a great grasp of Be-Bop improvisation. Always great fun to play with. Michael is another friend (and medic) from UCL - a versatile jazz pianist and band leader. His rat-pack group Down for the Count plays at functions across London and the UK and whose clients include The Royal Air Force. "Down for the Count are a 9-piece function band performing jazz, Rat Pack, swing, soul and Motown music for wedding receptions, corporate events and private parties all over the country. These experienced musicians can also provide classical or contemporary music for a wedding ceremony, or a small jazz band playing background music during dinner or a drinks reception. This versatile and talented band transform the atmosphere of any event - playing sophisticated jazz music during dinner, Swing and Rat Pack classics to get your guests up on their feet, and Soul and Motown hits guaranteed to fill your dancefloor all night long"
You can find him at http://www.downforthecount.co.uk/ for a booking, or to see where their next performance will be.